Described by a Senate colleague as ‘the most ardent high priest of land values taxation that this country possesses’, John Grant, stonemason and labour activist, was born in 1857 in Abernethy, Scotland, to crofter parents, Gregor and Margaret. After completing his apprenticeship as a stonemason in Glasgow, he migrated to Australia, probably in 1880. Soon prominent in the Stonemasons’ Union in Sydney, he was closely involved with the emerging Labor Party and played a part in the early disputes about Caucus solidarity and ‘the pledge’; also in policy debates around the fiscal issue and industrial arbitration. He was a follower of Henry George’s single tax philosophy, which advocated that land alone should be taxed. Grant held to this philosophy throughout his life, to the sometime annoyance of his industrial and political comrades. In evidence before the royal commission on strikes in 1891, he showed himself to be a sophisticated exponent of industrial militancy. Over a period of thirty years, Grant held prominent office in his union and was a regular delegate to the Trades and Labor Council and to state conferences of the Labor Party. 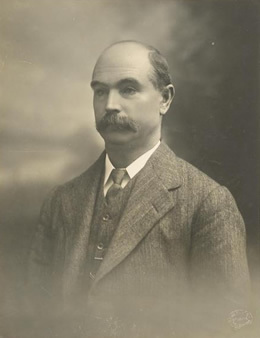 He was general secretary of the New South Wales branch of the Party (1903–15). He stood unsuccessfully for state seats in the elections of 1891, 1904, 1907 and 1910, and for the Senate in May 1913. He was elected to the Senate following the double dissolution of 1914. Grant came to the Senate with his outlook well formed. He entered with short-term senator, David Watson, as well as Albert Gardiner and Allan McDougall. The years from 1914–16 were probably Grant’s most satisfying politically. His party was in government with a sizeable Senate majority and he had some freedom to pursue his own concerns, even when these differed from his party—as they often did. Although junior in the pecking order of Labor senators, Grant was not reluctant to express his independent stance on subjects as diverse as the War Census Act, the development of the Federal (later Australian) Capital Territory and the uniform railway gauge. Gardiner at times found himself opposed by Watson, McDougall and Grant, but of the three, Grant seems to have been the most wayward and opinionated. It was Grant’s views on single tax that most often separated him from his colleagues. Even though many senators, on both sides of the chamber, had been ‘single-taxers’ at least for a time in their youth, Grant remained a vociferous exponent of Georgist values until the end of his career, though he confessed to be ‘not quite up to’ the views of Edward Bellamy. He lost no opportunity to press the case for the taxation of unimproved land values and for the abolition of all other taxes. His speeches were rich with quotations from Henry George. Grant seemed immune to discouragement, and on one occasion ploughed on for three hours on the subject of the single tax with quorums frequently having to be called. He showed great ingenuity in choosing unlikely debates in which to press his cause. Successive Presiding Officers routinely called on him to redirect his remarks to the relevant issue. A loquacious and determined speaker, Grant accepted these corrections philosophically, even learning to anticipate them. Grant was not, however, ‘a single issue’ senator. E. D. Millen, Grant’s erstwhile single tax friend, though also one of his chief conservative opponents, exaggerated in saying that there was ‘hardly any subject upon which Senator Grant has been silent’, though he was not far from the mark. Grant attacked creeping governmental bureaucracy, strongly defending working-class men and women who had run foul of it. During and following the war, he was a notable invigilator of cases of individual injustice at the hands of the military authorities, chairing, in 1924, the select committee, which investigated medical and pension provision for the disabled former soldier, Lieutenant Paine. Grant was also a shrewd critic of changes to the electoral law, drawing on his experience as state secretary of the Labor Party. He opposed proportional representation and supported lowering the voting age. Losing his seat at the 1919 election, Grant vowed to return and in 1923 did so, bursting energetically back into the Senate and clashing again with Gardiner, who in his term as sole Labor representative in the Senate, had grown unused to sharing a stage. Grant continued to promote the Georgist philosophy, winning bemused tolerance, but also specific support from his colleagues. In 1923, Grant succeeded in removing a tax on housing which had been imposed a few years before, claiming this as his greatest achievement in public life. Grant, who in 1915 had moved unsuccessfully for the appointment of a select committee to inquire into ‘the delay’ on the establishment of the federal capital, was also influential in the development of the leasehold system of land for the coming Australian Capital Territory. In 1924, he urged the government to reduce valuation periods and to require land usage to be defined. He lived to see the Commonwealth Parliament move to Canberra. The leasehold system in the Territory (though, as Grant would have seen it, greatly debased in subsequent years) must be regarded as a substantial monument to him. In 1925, Grant became a member of the royal commission on national insurance. In 1927, he proposed the establishment of a select committee on the moving-picture industry, although this was almost immediately overtaken by a royal commission, to which Grant was appointed. Among the commission’s recommendations was the establishment of a censorship board of three persons including one woman. Grant had been a strong defender of the Senate, once describing it as ‘the most democratic Chamber in the whole Commonwealth’. In 1923, he went so far as to claim that it would be ‘much more advantageous to abolish the other branch of the Legislature, and increase the usefulness of the Senate’. Grant’s story is incomplete without mention of Mary Ann Kearney, his wife of forty-four years, and political companion for at least as long, whom he had married in a Congregational Church ceremony in Sydney on 14 May 1884. Mary, who survived him, was born in London, England. She was a pioneer of women’s political activism, and among the first women to enter the Labor Party. Mary wasa delegate to the state conference from 1905 and a founder of the women’s central organising committee, later the women’s conference.The Grants had one son, Frank, who emigrated to the United States of America to work for the Westinghouse Corporation. Australian Worker (Sydney), 23 May 1928, p. 11; CPD, 5 July 1923, p. 717; NSWPP, Report of the royal commission on strikes, 1891, pp. 374, 378; Raymond Markey, In Case of Oppression: The Life and Times of the Labor Council of New South Wales, Pluto Press, Leichhardt, NSW, 1994, p. 48. CPD, 19 August 1915, pp. 5892–5893, 14 October 1914, pp. 106–108. CPD, 21 July 1915, pp. 5087–5088, 5 July 1923, p. 713, 28 November 1918, pp. 8477–8486, 8495–8510, 13 December 1927, pp. 3041–3043, 24 March 1920, p. 672. CPD, 16 October 1918, p. 6897, 17 July 1919, p. 10831, 24 March 1920, pp. 671-672; CPP. Report of the select committee on the case of First Lieutenant W. W. Paine, 1924. CPD, 5 July 1923, p. 713, 19 July 1923, pp. 1298–1302, 24 August 1923, pp. 3530–3531, 3544–3545, Senate, Journals, 6 May 1915; 27 May 1915; CPD, 15 May 1924, pp. 661–664, 18 June 1924, pp. 1308–1316, 8 December 1927, pp. 2840–2841; Frank Brennan, Canberra in Crisis: A History of Land Tenure and Leasehold Administration, Dalton Publishing Company, Canberra, 1971, pp. 61, 66–69, 74, 93–95, 115, 186. Senate, Journals, 3 March 1927, 15 March 1927. CPD, 11 June 1928, p. 5738. CPD, 15 July 1915, p. 4894, 13 August 1919, pp. 11496–11497, 8 August 1923, p. 2265. Labor Daily (Sydney), 21 May 1928, p. 1; SMH, 21 May 1928, p. 12; Queenslander (Brisbane), 24 May 1928, p. 62. This biography was first published in The Biographical Dictionary of the Australian Senate, vol. 1, 1901-1929, Melbourne University Press, Carlton South, Vic., 2000, pp. 55-58.